It’s weird to think that actual, functional virtual reality headsets have been in existence for several years now. It’s even weirder to think that you could easily not notice. Despite being science-fiction made fact, the adoption rate of VR has been relatively slow. This is due to factors ranging from a high price point to unforeseen problems such as widespread motion-sickness, and the small fact that you need a spare room to get the best out of the hardware. One issue that is no longer a problem, however, is the number of games available to play. In the years since the debut of the Oculus Rift and the HTC Vive, there have been dozens, maybe hundreds, of experiences released for both platforms. Because of this, we thought we’d run-down some of our favourite titles which show off VR at its best. 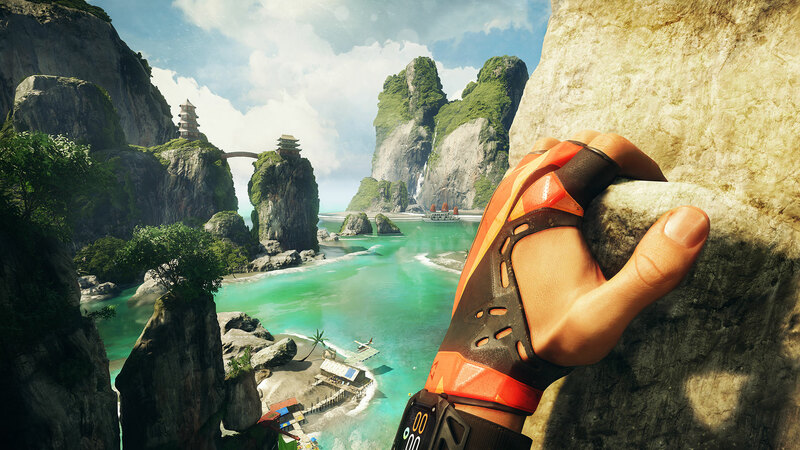 All of these games are playable on both the Oculus Rift and HTC Vive – although some of them – such as The Climb, are only available on the Oculus store. The list itself is in no particular order save for the final game on it, which is our pick for the best VR experience in existence right now. Valve-developed launch title for the HTC Vive, The Lab was created as an introduction to VR and remains an excellent place to commence any VR adventure. 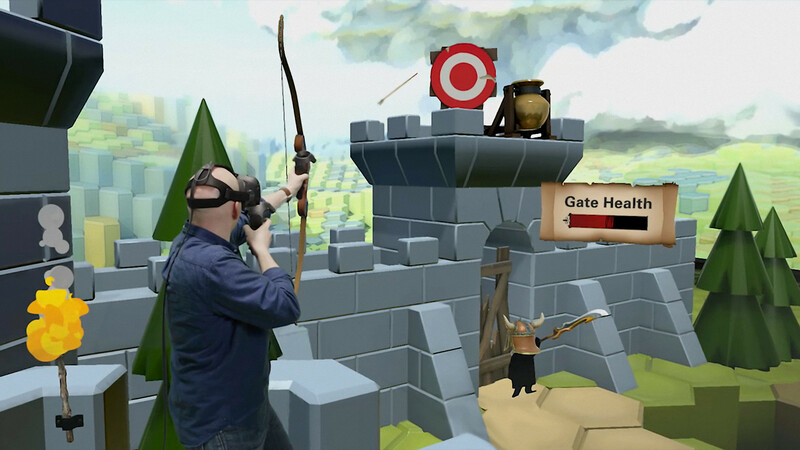 It comprises several mini-games designed to showcase the range of potential experiences available in VR. Some of these are little more than interactive galleries that let you stand on top of a gorgeously rendered mountain-scape, or wander around a moving solar system. Others are more interactive, such as building a robot out of spare parts or playing a miniature game of Space Invaders by holding a tiny spaceship in your hand. The standout games, however, are Slingshot and Longbow. Slingshot has players firing tiny metal “cores” at piles of cardboard boxes, attempting to topple as many as possible by retracting and releasing a giant mechanical catapult. Longbow, meanwhile, involves defending a castle from an approaching army by shooting its soldiers with a longbow, which you have to nock, draw, and loose using the touch controllers. The Lab is set in the same universe as Portal and shares its light-hearted tone and wry humour. The cores featured in Slingshot are voiced by a variety of actors, including Dan Harmon, the co-creator of Rick and Morty. It is ultimately just a collection of mini-games, but that, alongside the fact that it’s free to download, are what make it such a great starting point. Longbow in particular remains one of the best short VR games out there. 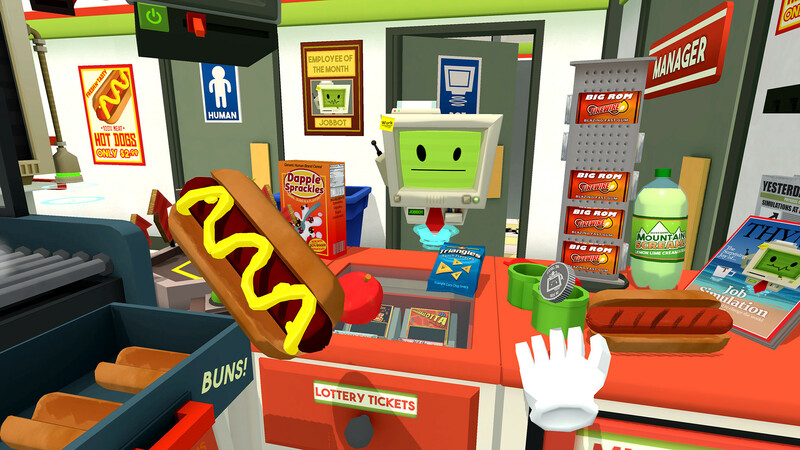 It’s bizarre that one of the best games in VR is themed around working a boring nine-to-five, but that’s exactly what makes Job Simulator another great entry-point for newcomers to virtual reality. Job Simulator takes place in a far-flung future where robots do all the hard graft, and humanity has so much time on its hands that it has created a museum to labour, where layabout humans can experience a life of salaried servitude. There are four available “jobs” in the game: Auto Mechanic, Office Worker, Checkout Assistant, and Chef. Each of these jobs involves interacting with a bunch of items and equipment in your immediate surroundings to complete a series of tasks. The Checkout Assistant, for example, needs to scan items for his robotic customers and work the till, while the chef has to cook various dishes using a range of ingredients and cooking equipment. Job Simulator communicates the tactility and perspective of VR well in a low-pressure setting. You’re constantly pushing buttons, throwing switches, turning dials and moving objects around with your virtual hands. Like The Lab, it also has a wry sense of humour. The Office Worker’s tasks include “Cooking the Books”, which involves dropping numerous account ledgers into a gigantic furnace. Who said life in the rat race was dull? One area where VR is weirdly effective is cockpit-based games. There’s something about the separation between the player, the cockpit, and the outside world that communicates the 3D effect of VR superbly. The current generation of headsets also render nearby objects far better than distant ones, so sitting in a consistent, enclosed space is a perfect setting for VR. 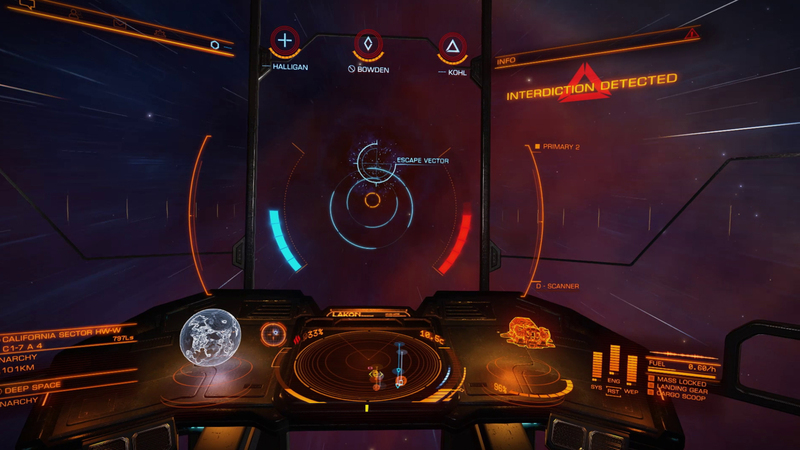 While there are a bunch of cockpit-based games that support VR, such as Project Cars and Eve Valkyrie, none are as effective as Elite Dangerous, which uses VR’s head-tracking to great effect. As well as letting you experience landing on a planet in stereoscopic 3D, Elite Dangerous lets you bring up your ship’s system menus by glancing to the left and right of your cockpit. It also makes following enemies in combat much easier, as it entirely separates your avatar’s movements from your ship. This enables you to watch your opponents through the cockpit’s windows and canopy, adjusting the flight controls to compensate in a far more instinctual manner. Elite Dangerous does suffer from some unavoidable drawbacks. Distant objects look grainy and smudged compared to playing on a regular HD monitor, and dogfighting with six degrees of freedom is rather punishing on your inner-ear. But if you can handle the nausea and don’t mind a drop-in resolution, Elite Dangerous is one of the best VR experiences available. Bethesda has been gradually adding VR support to many games in its back-catalogue, including Fallout 4 and the 2016 reboot of Doom, but the recently released Skyrim VR is by far the best of the bunch. 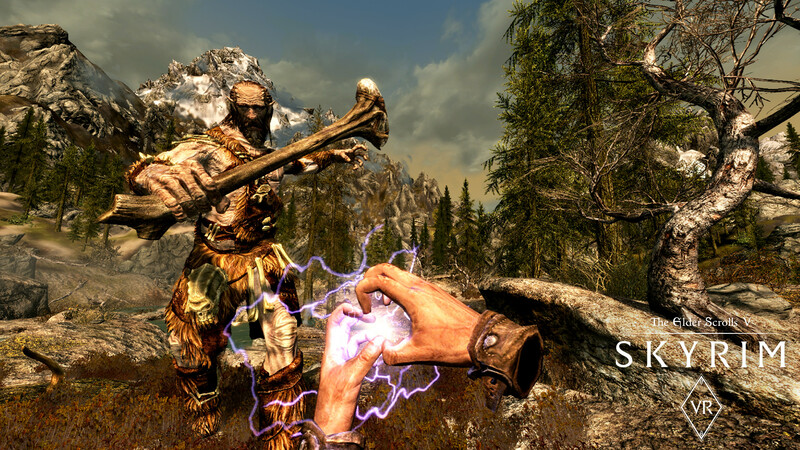 To begin with, Skyrim’s rugged landscape seems almost purpose-built for VR. Standing at the foot of the Throat of the World and looking up is a powerful demonstration of how VR simulates scale. The game’s panoramas are somewhat diminished by the screen-door effect of VR’s low-resolution, but the world of Skyrim is still a remarkable place to explore in virtual reality. 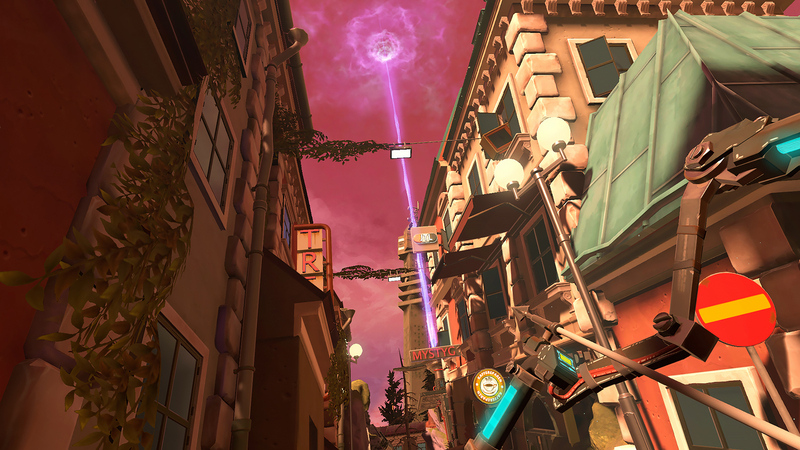 VR also fundamentally alters how the game plays, particularly combat. Melee weapons like swords are now swung using the touch controllers, while bows are drawn and loosed just as you would with a real bow. But it’s magic that receives the biggest boon in VR. There’s something about conjuring a fireball in your hands and then literally throwing it at your enemy that is incredibly satisfying. Unlike Elite Dangerous, Skyrim wasn’t developed with VR in mind, and in some areas that shows. Moving around via teleport, while a necessary evil to combat motion-sickness, simply isn’t as satisfying as standard movement controls. It’s also a standalone, full-priced release, which may be somewhat galling for those who already own Skyrim (although it does come with all the expansions). Still, VR games of this size are thin on the ground, and there’s enough that’s different about Skyrim in VR to (just about) justify investing in it a second time. Most VR games iterate on ideas already explored in non-VR gaming, but The Climb is one of the few purpose-built VR games that simply wouldn’t work on any other format. Developed by Crytek, it’s a climbing simulator that challenges you with scaling a series of mountains and rock-faces. The Climb uses VR touch controllers to simulate your virtual hands, which you use to grab handholds and pull yourself up rock-faces ranging from the mesas of the central US to snow-bound Alpine mountaintops. It’s a highly physical experience, forcing you to stretch your arms to grab distant handholds, duck beneath low hanging rocks, and even propel yourself across chasms by pushing out with one hand and “catching” yourself with another. You’d think that a game spent mostly staring at a rock-face might get a little repetitive, but Crytek does a lot of work to ensure that its vertiginous environments are chock full of detail and variety, from bugs and other animals crawling on the rock-faces to more spectacular events like helicopters and wingsuiters flying past your ears. The only downside of the Climb is that the game’s beautifully rendered vistas are made somewhat redundant by the problems VR has with rendering distant objects. This means the views that act as your reward for reaching the summit aren’t as stunning as they could be. But the act of climbing itself is nonetheless a fun and rather dizzying challenge entirely unique to VR. Most dedicated VR games are brief, disposable experiences, as there aren’t many people with the space or constitution needed for sustained play. Apex Construct is one of the few games that aims to be different. It casts you as the last surviving human in a post-apocalyptic future, one dominated by a conflict between two AIs known as Mother and Father. Built specifically for VR, Apex Construct takes a novel approach to both environmental and systemic design. The world you explore favours close-up detail and verticality over horizontal sprawl. Its semi-open levels are built from shattered chunks of Earth that play home to toppled apartment blocks and decaying scientific laboratories, meaning you’re constantly craning your neck to look up at some vast mountain of rubble, or standing at the edge of a precipice to gaze into the drop below. The game blends Victorian-style brickwork with futuristic blue-chrome in an aesthetic strongly inspired by Half Life 2. The game itself is a hybrid of narrative-exploration, physical puzzle solving, and longbow-based combat. Puzzles involve rummaging through office drawers and storage rooms for keycards and door-codes, or manually inputting commands into virtual computer terminals. One particularly neat feature is that your inventory is attached to your left hand, and you physically place and remove items in and out of it. Mostly, though, Apex Construct is notable simply for the fact that it commits to telling a proper story and adding layers to both its world and systems design. The original Superhot was a first-person shooter with the gimmick that time only moved when you did, a mechanic designed to produce graceful, Matrix-style slow-motion fight-sequences within its gloriously drawn world of white backgrounds and glowing orange enemies. Superhot VR is a standalone game designed specifically for the format, and the result is quite possibly the best VR game in existence. The game itself comprises several dozen short fight scenes which puts a bunch of enemies in a room with you, and an assortment of weapons at your disposal. These range from guns which can be picked up and fired, to throwable objects like knives, hatchets, and environmental items like ashtrays and billiard balls. All you need to do is kill all the enemies in the room, while dodging their bullets and avoiding their melee attacks. What results from this is you screaming 'I AM NEO!' as you duck behind a table and raise your arms over the edge, spraying bullets in a dual arc from your twin pistols. 'DODGE THIS! ', you shout, as you throw a knife into a man’s head, shattering it into a thousand pieces, before snatching his shotgun out of the air, turning to face another enemy about to strike you with a hammer, and planting the barrel of your weapon square between his non-existent eyes. 'ANOTHER MATRIX REFERENCE! ', you scream with power-mad glee, despite the fact that in reality you’re prancing about your living room wielding two remote-controls with a box strapped to your face. 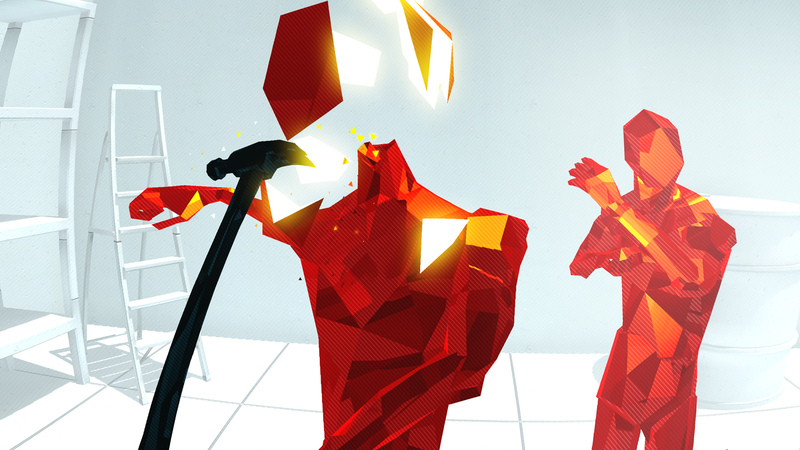 I’ve enjoyed nearly every game that I’ve played in VR, but Superhot is the only one to make me completely forget about the fact that I’m an overweight 30-year-old man who is more likely to slip a disc than do a backflip. It’s more than just immersive, it’s transformative, utterly absorbing you in its stunning, thrilling, intoxicating fiction, and that’s despite its highly abstracted visual style, which actually works really well in VR, as it isn’t affected by the resolution issues. The only negative I can think of is that it is quite intense, and perhaps isn’t ideal as a first experience in VR. Nonetheless, it is, in my opinion, the best experience in VR, and by quite some margin.